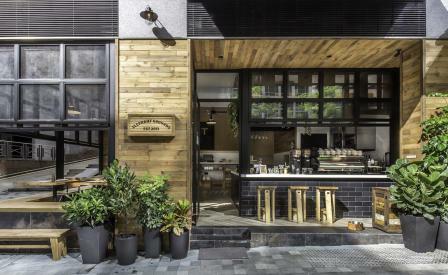 The latest to join Star Street’s picturesque village of small, interesting cafés, home goods stores, and fashion boutiques, is gourmet coffee roaster Elephant Grounds. Located opposite a small public plaza, the café’s design, by newly founded studio JJA/Bespoke Architecture, maximises the café’s coveted corner site using a glass and metal façade that - at the touch of a button - can be raised, allowing timber window benches to be used from the inside or outside. Cosy, unpretentious interiors offer a refreshing departure from the generic Scandi-meets-industrial-loft style that proliferates across the city. A rich warm timber material palette is embellished with a custom-made lush moss wall installation by local plant artist Quest Terrarium; understated handcrafted furniture by Start from Zero; and sculptural black metal pendant lamps designed by Portland-based brand Schoolhouse Electric. ‘I’ve also always wanted to diminish the formal line of the back-of-house versus front-of-house by designing a low coffee bar to make it feel like you are being served at someone’s own kitchen at home,’ says designer JJ Acuna. Although the excellent locally roasted coffee draws caf-fiends from across the city, it is very nearly upstaged by the inventive ice cream sandwich menu featuring salted caramel ice cream bookended with dark chewy chocolate chip cookies and embedded with crunchy caramel popcorn.